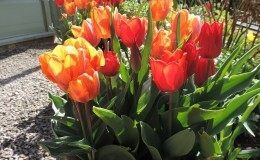 During April and early May our stunning tulip plantings should be at their best. We have had some spectacular new ideas in the past which were very popular and for 2019 we are planning even more eyecatching displays in the pots and borders, particularly in the Walled Gardens. We are hoping that tulips Ballerina and Brown Sugar with narcissi ‘Geranium’ and allium Purple Sensation will look wonderful flanking the middle path in the Vegetable Garden. The Rose Garden and Conservatory beds will be planted with Negrita, Ronaldo, Black Hero, Jan Reus, Red Shine, Antraciet, Recreado, Queen of the Night with a few Bolroyal Honey and Ballerina. Side borders will have Sapphoro, Purissima, White Triumphator, Mistress and China Pink amongst others. 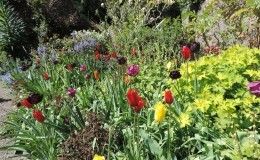 Our pots on the front steps and by the conservatory will contain tulips Havran, National Velvet and Princes Irene. We cross our fingers that we will be able to get all the tulips in and that nothing comes and digs them up or eats them! 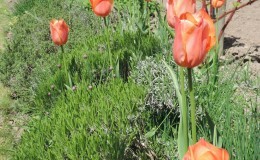 We hope you will come and enjoy our new plantings in the spring.